The real life experience of what a person goes through as they attain enlightenment. In the book The Golden Frog by Michael Mamas, you share with the characters their day to day life, their joys, challenges, and frustrations as they attain enlightenment and live life on that level. You come to intimately understand the resistances along the way and how they are overcome. If you’d like to know not the glamorized version, but the real world of human evolution, then you will find The Golden Frog invaluable. 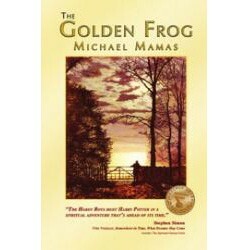 Winner of the 2004 Chelson Award for Fiction, The Golden Frog is based on the real, life experiences of the author, Michael Mamas.